Crabapple trees are close relatives of the common table apple, differentiated only by the size of their fruit. Horticulturalists define crabapples as varieties of the Malus species with fruit less than 2 inches in diameter. Crabapples bloom white or pink in early spring, and dwarf varieties remain small enough to plant under power lines, in landscaping beds, as specimen trees or as a background planting to accent spring perennials and flowering bulbs. 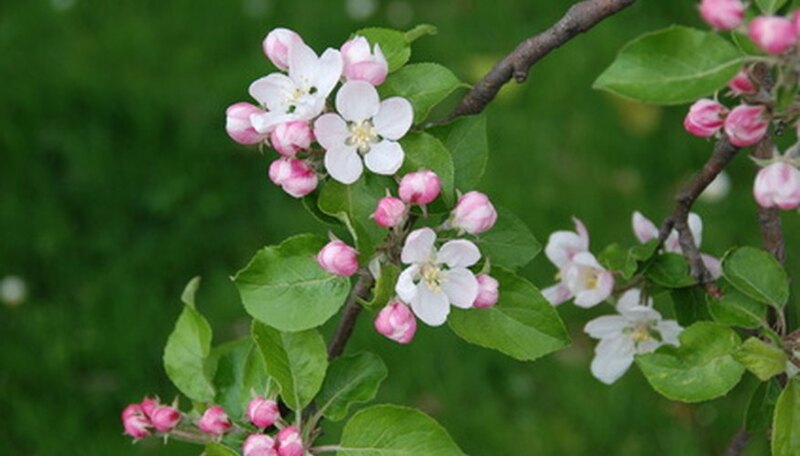 The Camelot (Malus "Camzam") dwarf crabapple bears hot purplish-pink-on-white flowers and grows to about 10 feet with an artful, rounded shape, according to the University of Missouri Extension. It bears a profusion of fruit less than an inch in diameter, which turns deep burgundy late in the season. This color change complements the burgundy tinge to the tree's autumn leaves. Camelot is disease-resistant, meaning that spraying for apple scab or rust can be diminished or eliminated. The Colorado State University Extension also recommends another dwarf crabapple in the Camelot breeding series, the Lancelot, as having superior disease resistance. Lancelot also grows to about 10 feet tall but bears yellow crabapples and sports golden autumn leaves. The Colorado Extension notes that Lancelot is excellent for very small spaces. The Sargent dwarf crabapple grows only 8 feet tall, according to the University of Missouri Extension, making it suitable for a wide variety of landscaping applications. Its pink buds grow into single white flowers, and its deep green leaves have an unusual lobed shape that differs from the usual Malus foliage. Its deep red glossy fruits remain on the tree throughout the winter. The Colorado State University Extension notes that the Sargent is a good performer in disease resistance trials, but does note that it tends to fruit only in alternating years. The Colorado Extension also suggests the Sargent Tina, an even more dwarf form growing to only 5 feet tall by 6 feet wide in a shrub habit. The fruit of both Sargent cultivars are highly attractive to birds. The Molten Lava dwarf crabapple (Malus "Molazam") grows to about 12 feet tall but has a striking weeping habit with white flowers draping its pendulous branches. Its small, bright red fruits persist well into the late fall, according to the University of Missouri Cooperative Extension. The Colorado State University Extension also recommends molten lava for its disease resistance and suggests Louisa as another hardy and robust weeping dwarf crabapple. Louisa bears pink flowers and tiny golden yellow fruit, making it a nice counterpoint to molten lava in the landscape.